The Amazon Freedom Sale is still going on and for day 2, we've listed down some of the best gadget deals available as part of the sale. Whether you’re looking for a speaker, a smartphone, or any other product, the Amazon Freedom Sale is a good time to finally buy the product. 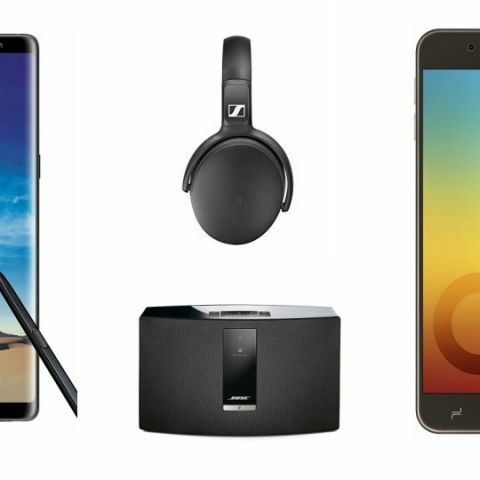 We have found some pretty good deals on Amazon on gadgets like speakers, smartphones, laptops and more. The Bose SoundTouch 20 Series III Wireless Music System connects to your home network via Wi-Fi. The speaker gives you access to internet radio and teh netire speaker can be controlled through the Soundtouch app. The device is also equipped with a USB port to play music via devices like pendrives. Click here to buy. The Dell Vostro 3568 is powered by a 6th Gen Intel Core i3 processor, which is paired with 4GB DDR4 RAM and 1TB hard drive. The device is also equipped with an Intel HD 520 graphics. However, one should keep in mind that the laptop does not have Windows 10, which means one needs to install an OS on their own. Click here to buy. The BPL Full HD LED TV offers a resolution of 1920 x 1080 pixels with a panel size of 43-inches. The TV has three HDMI ports, two USB ports, and an audio jack as well. Click here to buy. The Samsung Galaxy Note 8 sports a 6.3-inch QHD+ display with a resolution of 1440 x 2960 pixels. The phone is powered by an Exynos 8895 octa-core processor, which is paired with 6GB RAM and 64GB internal memory, which is expandable up to 256GB. Click here to buy. The Samsung Galaxy On 7 Prime sports a 5.5-inch full HD display with a resolution of 1920 x 1080 pixels. The device is powered by an Exynos 7870 octa-core processor, which is paired with 4GB RAM and 64GB internal memory. As far as the cameras are concerned, the device has a 13MP primary camera at the back, and a 16 MP front facing camera. Shoppers will also get an additional cashback of up to 10 percent on using SBI Debit/Credit card. Click here to buy. The Sennheiser HD 4.50 SE BT features Bluetooth 4.0 connectivity. The headphone comes with active noise-cancellation, which reduces the outside noise for a better listening experience. As per the company, it can provide up to 19 hours of audio playback on a single charge. Click here to buy.